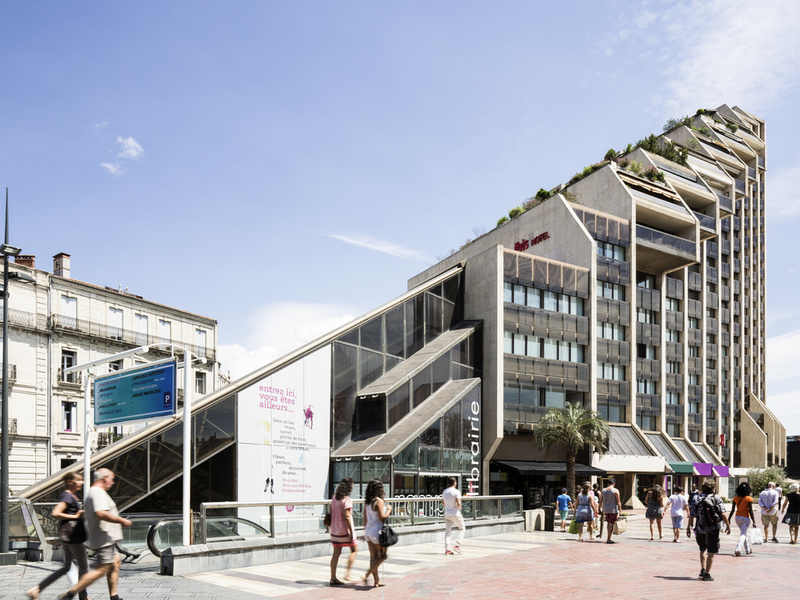 At the center of Montpellier, just a 2-min walk to Place de la Comédie, the hotel is ideally located for shopping or for taking a stroll around the pedestrian streets. The ibis Montpellier Centre Comédie hotel is perfect for business or family trips, with its large air- conditioned rooms, free WIFI, 24-hour bar and access to paying public car park. In just minutes you can walk to the Corum Conference Center, TGV train station, Opéra Comédie or historical district of Montpellier. In the center of Montpellier, from the Ibis Centre Comedie, you will discover the place of the Comedie, the Faculty of Medicine, the gardens of Peyrou, the triumphal arch, the garden of Plants, mansions, so many places steeped in history. In a few minutes of tram, access the main places where the economic and scientific activity of Montpellier develops: the Millennium, Euromedicine, Aréna, exhibition center, faculties as well as all the shopping districts. In the city center, near to Place de la Comédie, 5 min walk from the "le Corum" conference center and the historic center. Great stay! Wonderful! The hotel was very clean. I would use this company again. I chose this hotel because 1st, I a member of its loyalty program and 2, because of it central location. From the airport bus to the tramway, I was just a few walking steps away!!! The plus that I was not expecting was the exceptional professionalism of Paola! She is the true hospitality ambassador of your hotel : courtesy, patience, resourceful, kindness, all the qualities of a perfect hotelier! Friendly, helpful staff. Comfortable room. Good heating. Excellent location for shops, restaurants, cafes and the old town and it's sights. Close to tram stops. 24 hr snacks and beverages from the bar with friendly service. Walk or tram from the Saint Roch train station. I was supposed to stay at Ibis styles Comedie,, but reception there was very poor by a staff from Senegal origin, she wasn't friendly or nice in her approach. So I left and came to stay at Ibis Comedie centre, there the staff are nice and very friendly, they assist you how to get too places. We enjoyed the Ibis because it has clean rooms, a helpful staff and good breakfasts. Furthermore, at our request, the front desk demanded twice that the noisy guests next door quiet down — and the noise stopped. Thank you. Paula and several others were especially helpful. This is our favourite ibis hotel - and my husband and I always stay in ibis hotels when we're on holiday, so we've seen plenty of them! We always get a warm welcome here. Several of the staff remember us from year to year, and always make us feel special. The bedrooms are exceptionally spacious and comfortable, with a sofa and round table at one end as well as the usual work surface. Wonderful! Of course there are the signature ibis beds, the most comfortable I've ever slept in. The rooms are immaculately clean; the bar is bright and welcoming, and set slightly aside from the reception area which makes for a relaxed atmosphere as people aren't constantly walking past on their way to the reception desk. In summary: great rooms, comfortable facilities, wonderful staff. Love it! We're looking forward to our next visit. Good location. Good value for money. It was a little bit tricky to find the entrance to the hotel with a car. But it's easier to find parking so if you see the sign for parking Triangle, just enter and go to the -2 parking floor, there's a sign direct you to where the hotel elevator is. Parking is cheaper when you pay at the hotel. we stayed overnight and paid 9.5 Euro. The location cannot be better, it's right next to the main square and the access to old town. The staffs were very friendly and helpful and able to speak decent English. The room and bathroom are decent size also. The only thing is everything is a little dated in the room and I find them not very clean. The front desk staff helped me with a taxi, with an adapter, and the meals were great. Even though I speak French, it was a relief that the staff spoke English. The Médoc in the bar is really good, too! For me the best thing of the hotel was the perfect place where it is. The rooms were clean although I missed one towel for the hands. Fantastic location and very friendly staff. Rooms very clean and comfortable. Great Location. Lovely Room. Great Staff! Everything was easy from Check In onward. Fantastic location. Clean, comfy bed and spacious room. Staff were really pleasant and helpful. The room was clean and answered our needs, the staff was excellent and the location was also excellent. A pleasure. We enjoyed two visits in one month at the Ibis. Multilingual staff was helpful and considerate. The room was well appointed with all the necessary amenities. Montpellier is a beautiful city. Friendly welcome, even though we arrived late at night. Drinks still available at bar. Room good temperature, bed comfortable, lots of space. Breakfast is delicious, although a bit pricey. The hotel is in a great situation, although quite difficult to find. I had received a call from the hotel to help us if we were arriving by car. Altogether, great customer service. We received a warm welcome, had a large comfortable room (bigger than expected), good conversations with the evening and morning desk clerks, and received needed assistance in securing a taxi for our departure. We could not have been treated better and definitely would stay there again. Could not find hotel from car park.